A couple of years ago we started a hummingbird garden in memory of my mother-in-law. Many of the plants were chosen specifically to attract hummingbirds, while others were selected to expand it into a wildflower garden, plus we added a young dogwood to round things out. We also picked up a pretty little birdbath since we hadn’t had one for years, not since I accidentally knocked over our cheap one and broke it. 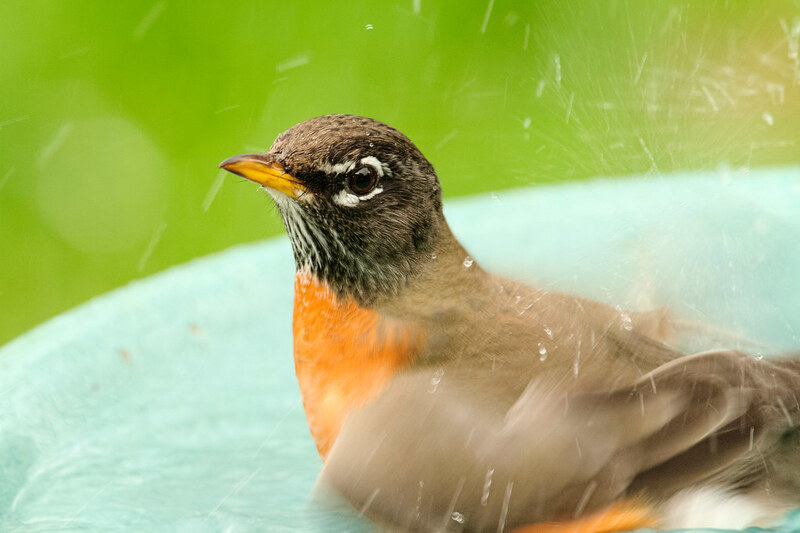 A number of birds, such as this American robin, have been enjoying the bath ever since. Purple coneflower is one of my favorites in our garden and we have a vigorous patch at the edge of our back patio. I deadhead them during the summer to encourage new flowers but at the end of the season I leave them be as I knew birds were eating the seeds in the dried-up cones during the winter — I just didn’t know which ones, as I had never seen any birds on the dead flowers. 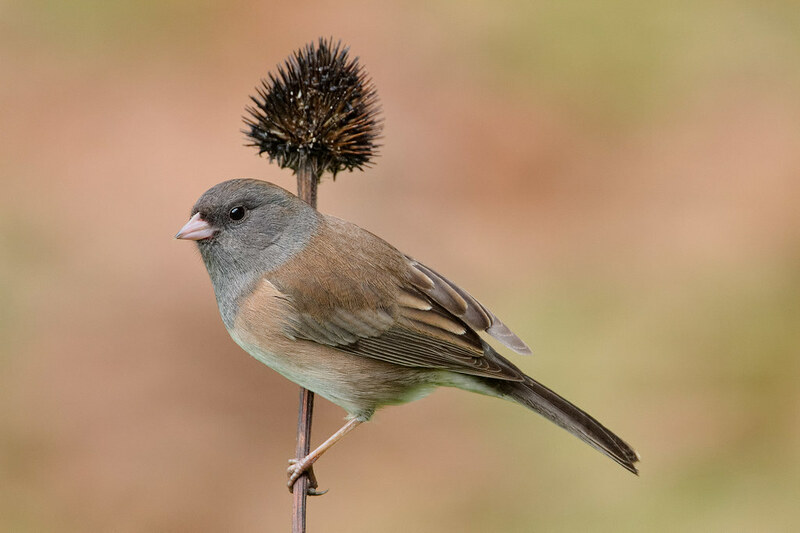 I had assumed my seed-eaters were finches but just discovered their true identity: dark-eyed juncos. Junco plumages vary across populations, this is a female of the Oregon race which we commonly see in our backyard, she’s perched on one of the coneflower stems. It’s going to be a white Christmas this year! A white Crosstrek Christmas! The dealer called late this afternoon to say our car had arrived and thankfully they were able to squeeze us in so we could pick her up right away. This is going to be the best Christmas ever! Will I be too excited to sleep tonight? I never could as a kid. We lived in Michigan in my younger years and one Christmas Eve with relatives in my room I ended up in the bottom bunk of my brother’s bed. Unable to sleep I contented myself with watching the snow fall outside his window. Suddenly there was a big gust of wind and snow as the bottom of Santa’s sleigh flew past, and just as quickly it was gone. The over-active imagination of a kid who loved Christmas? I know what I saw! Even today in my memory I see his sleigh flying by. 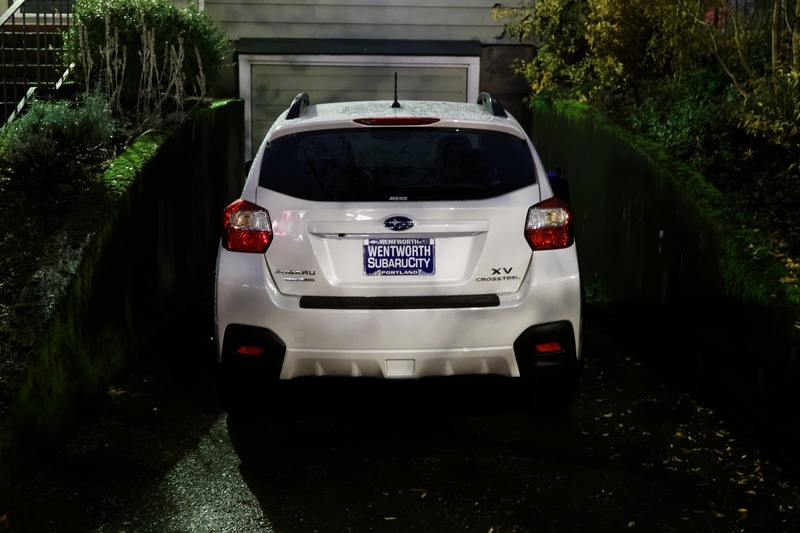 Technically speaking the Crosstrek isn’t a Christmas present. And besides, as much as I love the car, Sam and Emma were far better presents. But yes I am excited, and yes I have a lot to be thankful for. So too do Sam and Em, for I put up our artificial Christmas tree this afternoon. They were both sleeping under it before I even had time to spread out the branches and I don’t think they’ve left it in the hours since. Woodland cats, these two. Emma even tried to climb it while I was setting it up, but we know how that turns out. We started looking for a new car about a year ago, and ladies and gentlemen, we have a winner! Our list of potential new cars had shrunk to one, the Subaru XV Crosstrek, and pretty soon we’ll have one of our very own. They’ve been in short supply and high demand since they arrived on our shores a few months back, but our dealer emailed me yesterday that a black one just came in so we went down today for a test drive. We loved the car and while we’re not interested in black, fortunately a white one is due to arrive in one to three weeks so we put a claim in on it. I’m not normally a fan of white but I think the XV looks great in it. We’ve decided to replace the Civic first even though it has less miles than the Outback, it’s been a great little car but it just doesn’t fit our current lifestyle very well. So for the first time in over twenty years a Civic won’t be my daily driver. And the first time I won’t have a stick shift, which I’ll miss at times but not so much on my current commute with it’s heavier dose of stop-and-go traffic, and not at all at Ridgefield where the stick was downright obnoxious at the slow speeds I drive on the auto tour. I’ll certainly miss the moonroof but not the several inches of headroom it robbed me of. Not there will be any tears shed when it comes time to hand over the keys, these next one to three weeks can’t pass quickly enough!